Tigers & Strawberries » Reviewing The Preethi: I Picked a Winner! Reviewing The Preethi: I Picked a Winner! So, here’s the post that the kitchen geeks have been waiting for: the review of the new Preethi Eco Plus wet/dry grinder mixie. First of all, let me explain why I picked out the Eco Plus instead of one of the other, newer models of Preethi. It is quite simple–the other, newer models, such as the Chef Pro Plus and the Blue Leaf Platinum, looked like they had a lot more gewgaws and bits like storage containers which I had no need of. 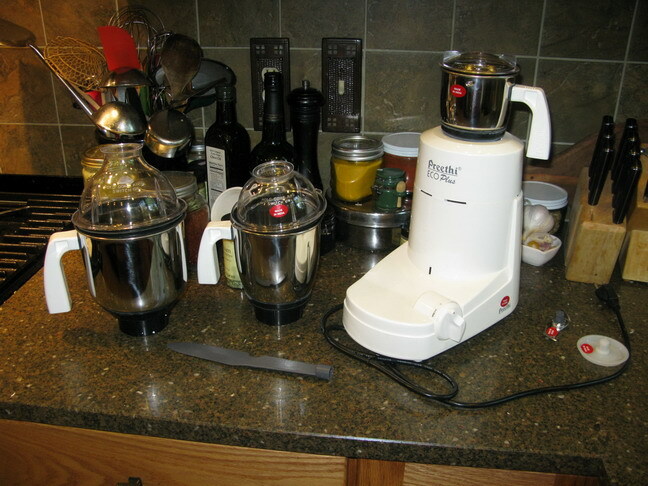 They also had a lot more plastic parts–and as I am hard on my kitchen equipment, I am enamored of nice tough materials like the stainless steel mixing/grinding jars of the Eco Plus. In addition to having more plastic and extra accessories which did not interest me, the Chef Pro Plus and Blue Leaf Platinum are both higher in price than the Eco Plus. All three models have a 550 watt motor, and the jars have the same basic capacities, so I went with the lower price, stainless steel jars and fewer accessories of the Eco Plus. Now we come to performance. I put the Preethi through her paces: I used the chutney jar to grind dry spices (peppercorns, nutmeg, cinnamon stick, cloves, black cardamom, cardamom, cumin, coriander and dried chilies), wet spices (ginger, chilies, garlic and cilantro), a mixture of the two, and hot, caramelized onions. The grinder performed admirably at all tasks. The dry spices whirred through the machine and in seconds, were reduced to a fine powder. The wet spices I cut into chunks, and ground up in the order that the instruction manual called for–and a smooth paste resulted in a few seconds without the use of additional water. To do the combination of wet and dry spices, I ground the dry spices first, then put the wet stuff in, cut into rough chunks as before and within seconds a fragrant paste was made. The hot caramelized onions were pureed in mere seconds as well. Cleanup was simple–as per the instruction manual, I put a bit of water and detergent into the jar, put it on the motor and whirred it about to clean the interior. Then, I rinsed well and wiped down the outside and let it dry on a towel on my counter overnight. The instruction manual says not to clean the jars in a dishwasher, so I am not going to do it. I am being good! Then, I used the larger jar to make lassi–you can see the frothy results in my post from Sunday. Crushing the ice was no issue for the Preethi, nor pureeing frozen strawberries that were still like little rocks. Whipping everything into a froth was also simple and fast. The one thing I will note is that the removable top portion of the lid that allows you to drizzle liquids in while the machine was running was prone to leakage of lassi. I did accidentally overfill the jar, so that is probably why. Oh, and I should mention that you are supposed to hold that little lidlet thingie down while running the machine. No starting it up and walking across the room because your cat is on the counter and you need to shoo it away. Nope. I suspect that would result in lassi on the ceiling, so take my advice and throw a shoe at the cat and keep your hand on the Preethi. Or, alternatively, turn it off before walking across the room and dealing with the cat, though the shoe throwing is more cathartic and fun. I also made butter, well, I did, and then I screwed it up by overmixing it, but that was not the Preethi’s fault, but my own. But, let it suffice to say that butter is churned in under a minute, so keep that in mind and stop the Preethi as soon as chunks of butter slap up on the clear lid. Now, you are thinking–that stuff was all easy. What about heavy-duty grinding? Like of lentils and beans and stuff, which the Preethi is specifically advertised to do. I used it to grind soaked dried chickpeas for falafel, and, after a slight mishap, the Preethi turned the crunchy beans, spices, onions and garlic into a nice smooth paste that was ready for deep frying in the wok. What was the slight mishap? Well, I thought I had broken it for a moment. As I was grinding the beans, the motor ground to a halt and stopped dead. All in all, I am thrilled with my purchase. I have to say that the documentation included in the box is sparse. The instruction manual gets the point across in a spare and taciturn manner, though the English is pretty well grammatical and sensible. The instructional DVD is nigh-well useless though–it seems to all be television commercials, and even though you can select English on the menu, it is still a mixture of Indian languages with a tiny bit of English. But that doesn’t matter. The Preethi Eco Plus is a very good appliance which does many jobs very well and is going to be a wonderful workhorse in my kitchen, helping me make Indian, Thai and Mexican foods as well as frozen alcoholic beverages, smoothies, milkshakes and other tasty things. Now–I have to say–it doesn’t do everything. It has no shredding attachment, or slicing capabilities–for that you will still want to keep your food processor. But if you want dry spices ground to a powder and wet spices pureed smoothly and lentils and beans ground and made into doughs or batters and lassis and butter and all that stuff–you can turn to the Preethi without worry. I bought my Preethi fromPerfect Peninsula, and their customer service is wonderful. Their response time is fast, their shipping is faster and the folks who answer their emails are very nice and helpful. I have nothing but good to say about them–they are a great online resource for Indian cooking essentials. So, there we have it–my review on the Preethi Eco Plus–a grinder which has taken the place of my beloved but now deceased Sumeet. I hope that this review will be helpful to some of you, if not this moment, in the future. Thanks it was very helpful. Although I was kinda tempted by some of the gadgetry you mentioned 🙂 I too prefer the stainless steel containers. Good to know–I would not have noticed that I bet (that one had then and the others did not). Can you tell me if the Preethi works with dried herbs? I have destroyed 2 coffee mill/spice grinders, plus 2 food processors grinding dried herbs for medicinal products. I can’t afford to buy anything that breaks after a few days use. Thanks for the review. I’ve been looking for an Indian grinder since my Sumeet completely failed to arrive 2 years ago (still waiting for a refund, too). Looks like the Prethi would be perfect. Denise–what sort of dried herbs are we talking about? How finely are you trying to grind them? Are we talking roots or leaves or stems or what? And how dried are they? Are you grinding them to a fine powder? Small amounts of dried culinary herbs posed no problem for the Preethi–I tried grinding dried thyme leaves to a powder as well as some dried rosemary leaves and lavender blossoms. There was no problem. But it sounds like you may be grinding something other than just leaves and blossoms, so give me some more information so I can advise you. Fuzzy–I feel rather bad for the folks who ordered a Sumeet because of all the talking I have done about mine–at least three readers I know of besides you got caught up in whatever drama the Sumeet company went through in the past couple of years that turned them from a premier manufacturer of kitchen grinders to–well, I can’t say what I think of the company now in a polite fashion, so I just won’t. You are not the only one that the company took money from and did not deliver a product–and I REALLY do not appreciate that sort of business dealing. Thanks for the review! I was looking to buy a mixie too these days (after all your articles praising them), so this is perfect timing for me. Also, how good is she at replacing a blender? My cheap blender doesn’t really blend anymore. You know the ones, with 12 speeds, each with pointless text description like “Mix”, “Blend” and “Whip” (Really, which one is faster? No tears for the death of poor tools, unlike your old Sumeet.) I was thinking of buying a commercial one (Vita-Prep, etc.) to replace it. Would the Preethi allow me to postpone that purchase by being at least a good replacement for an average blender? And how would it compare to a commercial one? Christian–funny you should ask about Thai curry pastes. After I wrote this review, I made a batch of Panang curry paste, which includes a fair amount of galangal and lemongrass. The lemongrass was fresh, and the galangal I used was frozen–which is the only way I can get it here in Athens. I have found that frozen galangal is much easier to use in curry pastes than fresh–and it is just as fragrant and flavorful. The Preethi did, if anything, a better job with the galangal than the Sumeet did. I cut it into chunks about the size of my thumb–for those who don’t know galangal–it is as hard as a rock–and cut the lemongrass into 1″ long chunks. The Preethi took a couple of minutes to grind them up along with the garlic, ginger, chilies and whole spies like cardamom, cloves and cinnamon, and the paste came out smooth as silk. So–I can recommend the Preethi even more highly now that I know how well it works for Thai curry pastes. It works great as a blender, too. Better than the one you had–I hate those things, btw. I used it to crush ice and puree still frozen strawberries for a lassi a week or two ago and the Preethi had no trouble at all doing that and then whipping the rest of the ingredients–coconut milk, yogurt and milk–into a frothy, creamy thick drink. The only thing it cannot do is shred or slice–for that you keep your food processor. Thanks for the recommendation – I was planning on buying a Sumeet because my parents have been very happy with theirs, but after reading this I’ll get a Preethi instead! I broke a coffee grinder trying to grind turmeric root in some crazed quest for authenticity. Yes, it is more fragrant to grind the dried, cured root than to buy it pre-ground in bags – but No, it’s really NOT worth breaking equipment over. Anyhow…to Denise’s Q: I have since learned that with hard items like this it can be done only if the hard item is broken up into small pieces first in a mortar & pestle, and finished in the coffee grinder for the final grind. I have since ground turrmeric thsi way successfully. Although my verdict is still that buying ground turmeric is way easier and almost just as good. Hmm. Perfect Peninsula doesn’t list the Eco Plus anymore! Only the Eco Twin (less versatile) and the newer models with plastic jars. Blah. A foodie on Chowhound.com linked your Preethi reviews for me. I love your blog and can’t wait to read more. Preethi is a very popular brand in India as well as Dubai (where I live—has huge South Asian population). I am relocating to the USA in a few months and I was wondering what to do about serious grinding since the US has voltage issues. In Dubai, a Preethi multi jar grinder costs about $40. I was shocked to see the American price but I guess I will have to spend that because one needs the American voltage model. I am just wondering how your Preethi is looking now, it has been like 9 months since you purchased it. Any update? Still 100% satisfied? Luckyfatima–I still love the Preethi, and it is still in good shape. I’ve ground up channa dalia in it with no problem, I use it at least once a week, usually way more than that, to grind up spices for dry or wet masala, and I’ve used to large jar to make smoothies and lassi, and even to make butter from cream. The only thing I have not done is to grind up the grain and rice for dosa batter yet, because I am just learning about South Indian cuisine and haven’t gotten the nerve to make them yet! Hi Barbara – I also found you through Chowhound, after looking for info on the Sumeet, which I read about in Nila Ipachoria King’s My Bombay Kitchen. Your Preethi sounds great. My blender and FP both died recently so I am in the market for a new appliance. I was wondering whether the Preethi would also work for baby food? E.g. pureeing cooked foods. If so, I think I will bite the bullet and buy it. Thanks! Hi Barbara, good to see the blog back! I’m contemplating a wet/dry spice grinder because the old coffee grinder is falling short. I have a vita-mix already, but the fixed blade design means it’s difficult to scrape a paste out of the blender. (I haven’t tried it with small dry quantities.) How easy it is to get a paste out of the Preethi? Simple. It also has fixed blades in the bottom, but I can scrape most of the goodies in a paste out of it with little to no trouble.